Successful playwright Lillian Hellman (Jane Fonda) reminisces about her dearest friend Julia (Vanessa Redgrave), who is a human rights advocate in pre-World War II Austria and Germany. Lillian recounts the events that lead Julia to ask her to smuggle $50,000 into Nazi controlled Berlin to be used to free some wrongfully held political prisoners and other innocent people. When this film came out in 1977, it was nominated for a ridiculous amount of Academy Awards, 11 in total, and took home 3 when all was said and done. But to tell you the truth, we would have never even heard of this movie if we weren't for our continual Oscar quest. It's is true that it came out before either of us were born, but a lot of flicks came out before we were born that we love. This is just one of those movies that seemed politically important at the time it was made, but simply didn't have the staying power of other more crucial movies of its era. This movie also shows how just anything about WWII and the Nazi persecution of the Jewish people was seemingly made to be Oscar-baity, even back in the 70's, so not that much has changed as far as the Academy is concerned. 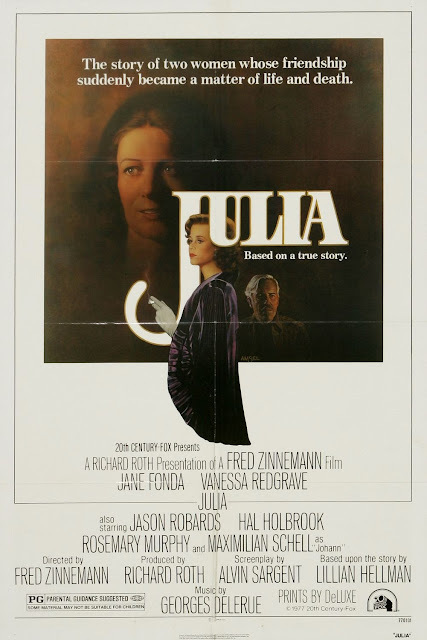 Though it does take a different approach and tell a different story about the historical events of WWII, for us, "Julia" was rather poorly paced. It moves really slow at some points and only has a couple moments that are really intense. When Lillian, played by Jane Fonda, is in Nazi occupied territories like Austria visiting Julia, played by Vanessa Redgrave, in the hospital, or when Lillian is smuggling money sneakily into Berlin for Julia, these are the times when things get really interesting and exciting as viewers. The rest of the film involves Lillian wondering about Julia, thinking about how is she doing, or what is she doing, and wondering when, if ever, she will see her again. These periods of lulling slowness in between intense moments are rather uninteresting and stuffy, almost bringing the movie to a grinding halt. The entire film is shown through flashbacks, and then flashbacks of flashbacks, as it jumps all over a vague timeline throughout its two hour run time. There are a lot of scenes that are meant to build up Lillian and Julia's characters both individually and together, to show how their friendship grew over the decades and reveal how the first got close but then faded as time rolled on, but mostly we found ourselves simply not caring very much about this build up. The whole story overall is very disjointed. As far as the acting goes, when you match up the amount of screen time Redgrave and Fonda have minute for minute, Redgrave's amount is much, much less, and somehow, she is able to give the more powerful performance of the two. Ultimately, we found ourselves unaffected by the personal tragedies being expressed in "Julia." Though the score throughout the film and the location where the movie is shot and set are both beautiful, there aren't enough interesting moments to offset the amount of mundane, tedious flashbacks and lulls in alluring details. Redgrave's performance is good, but not good enough to be compelling enough to make us care about the story as a whole. One year ago, we were watching: "Lucy"